Cape Town to PE flight bookings qualify to earn our exclusive travel vouchers! Simply email a review of your flight (including photos) to cheapflights@southafrica.to (the more high quality material you send, the more vouchers you get). Ask for Help - we're itching to show flight deals. Using the flight price comparison tool (on the left) to search, contrast & book the cheapest flight deal from Cape Town to Port Elizabeth. 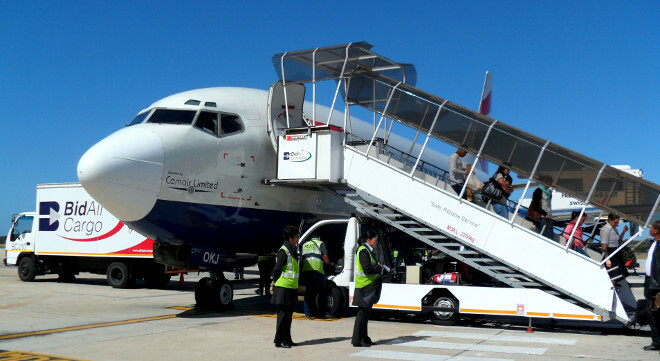 On Saturdays & Sundays, Flight BA6321 is scheduled to leave Cape Town at 10h35 and arrive at Port Elizabeth at 11h45. On Mondays,Wednesdays, Thursdays, Fridays flight BA6323 is scheduled to leave Cape Town at 11h35 and arrive at Port Elizabeth Heathrow at 07h50. 2013-10-15 Rating 4/5 : I have just gotten back to the real world after an incredible one month’s holiday spent between East London and Cape Town. The holiday was planned long in advance but turned out to be quite a nightmare getting all the affairs in order, although mind you the actual booking of the plane tickets took no more than 10 minutes, taking into consideration that most of that time was spent freaking out over which seat to choose! With our lives as busy as they are and our time being so limited having the ability to book and plan your entire holiday from the comfort of your home or office is truly a blessing. South Africa Online Travel has made it that much easier as well by presenting you with the cheapest and most speedy flight options. It was the first time I was flying with British Airways and it was such a great experience. Brilliant weather and the friendliest of staff really made for the perfect flying conditions. We arrived at the airport with two hours to spare and giving us time to get ourselves comfortable and organised for the start of our holiday. Unfortunately when we arrived at the check-in counter we had to rearrange our bags and packing because we had been given incorrect information about flying with a surfboard – we were those people! Thankfully that endeavour was over quickly and painlessly and the woman that we dealt with was so wonderful. We got a quick bite to eat at Spur as we watched everyone fuss about the planes, loading and offloading baggage and going about their daily duties. We played cards and chatted about our much needed and awaited holiday and then made our way to the boarding gates. We got there with time to spare and sat down to wait for the gate to open so we could make our way onto the plane. Seconds later we hear our names being called over the intercom and the words ‘last call’ follow them. We were right in front of the boarding gates! We are still trying to figure out how on earth we got from being extremely early to holding the plane up. Great way to start the flight home! The take-off is my favourite part of flying, where you’re travelling so fast that you start lifting off the ground and all of a sudden you’re going up but your stomach is going down and you have this incredible mix of excitement and nervousness. To make it all better we were taking off from a Lilly speckled runway only to get into the air and pass over the sea, dams, rivers and snow capped mountains – what more could a person ask for? Unfortunately I soon discovered that I have a bit of claustrophobia and having zero breeze or fresh air flowing over me was a bit of a problem, but I worked through it by taking photos of the world beneath us and playing the Alphabet game. If you ever have time to kill or have children that you need to keep occupied then the Alphabet game is the way to go. You choose roughly three to five categories and then you have to name a word in each category starting from A and working all the way through to Z. It’s harder than it sounds, but great fun. We even roped in the in-air staff and gave them a few chuckles. We were served a light snack and drinks, and I cannot tell you enough how wonderful it is to see companies now catering for vegetarian and other food preferences! The food was delicious and the drinks were plentiful. Before we knew it an hour had passed and the captain was informing us of our descent. We circled over Port Elizabeth and took a quick trip over the sea, it was so breathtaking seeing everything from a bird’s eye view. I think that if we come back in another form, then I would like to come back as a bird! Unfortunately there is much to be desired from the Port Elizabeth airport only because the first thing you are greeted with on your left is a rundown township and I can’t really say that it is the best advertisement for the little city, especially when it is such a beautiful one. We were greeted by the infamous PE wind and made our way quickly into the warmth and calmness of the baggage claims only to be utterly and completely surprised by the sight of both my mum and my brother. We bowled them over with hugs and kisses and compliments to set a person up for life. We met up with some of our closest friends for a quick lunch that turned into a three hour catch up and then drove down to East London arriving long after our estimated time. The two weeks that we spent in East London were filled with long walks on the beach, surfing, braais, relaxation and taking in every second of family time. We’ve come back to Cape Town a few too many kg’s heavier but I would do it all over again if it meant teatime being spent with my grandparents listening to the record player and reminiscing. We drove back to Cape Town to start my mum and brothers two week holiday and to end off our month holiday, where we hiked and climbed to the top of Table Mountain, took a trip to Kalk Bay, explored the Two Oceans Aquarium and walked in the forest and amongst the flowers every day. It was one of the best ways to start our holiday, from running around like a headless chicken looking for a scale to weigh our bags, to being late for a plane we were originally early for, from a beautiful flight to delicious in-flight meals, from surprises at the baggage claims to a lunch in the sun filled with love and laughter. It was a trip I won’t be forgetting in a hurry. Thanks British Airways for an eventful trip to see my family and thanks to everyone for making it so difficult to come back to Cape Town. In total I would definitely rate the entire experience a 5 out of 5, but if I’m critical and unbiased I would have to say a 4 out of 5 because nothing is ever perfect and when will airplane manufacturers design planes with leg and arm room? I cannot wait until our next holiday!